The largest shila (upper left) is Sri Jagannatha. Next to Him (upper right) is Sri Purushottama. Next (lower right) is Sri Sudarshana, and then (lower left) is Sri Jagannatha Sudarshana. Sri Jagannatha and Sri Purushottama each have chakras visible in Their forms. Since Sri Sudarshana is a shaligram-shila (i.e. Visnu-tattva), He too is Jagannatha and Sudarshana combined. 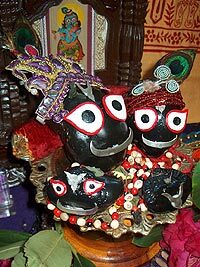 Thus each of these shilas is in truth Jagannatha-Sudarshana, though They are differently named. Cushioned by gunja-mala, a string of beads dear to Srimati Radharani, They sit upon Their brass Sudarshana throne. In my care are five most auspicious Shaligrams. These were given to me by HG Sri Krsna Caitanya Prabhu, who is the head Ayurvedic doctor at the Bhaktivedanta Hospital in Mumbai. They were originally worshiped by a Nepali brahmana. 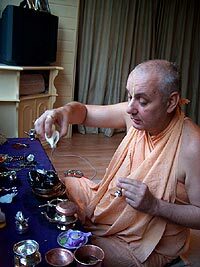 Sri Krsna Caitanya Prabhu is himself a Madhva brahmana with doctorate from a Sanskrit-medium ayurvedic university. 4) and a beautiful Shila identified by the brahmana as Vishnu, but whom I worship as Purushottama. 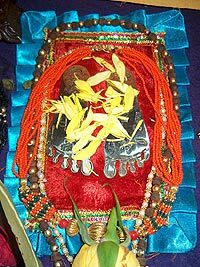 The golden lotus feet of Srimati Radharani. Note the symbols peeking out from under the flower petals. Srimati Radharani stands in separation next to Her Lord Jagannatha. that Lord Jagannatha enjoys the transcendental body of Srimati Radharani which is like a cool lake. 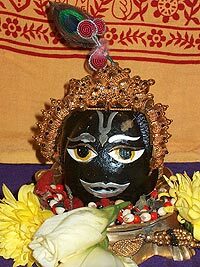 Thus my shaligram puja is simultaneously Sri Sri Radha-Krsna puja. Govardhana Shila by an elderly shila-reading Vaishnavi who stays at a temple next to Kusum Sarovara. She said He was used as a marker stone by a pilgrim who did dandavat parikrama around Govardhana hill. 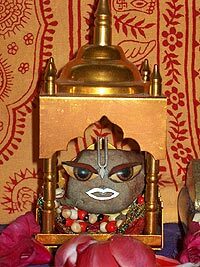 I left this Giriraj on the Vaishnavi's altar for a few nights, then she gave Him back to me. Reason: you can only "take" Giriraja if He is given to you by a devotee resident of the holy dhama. of Ananta Narsimha. My daily puja starts with Him, to remove obstacles from the seva. The main altar is Nepali style, carved from wood. It contains three pictures: of Srila Prabhupada, Sri Pancha-tattva and Lord Jagannatha as Gopijanaballabha. The main seva I do (after the opening Nrsimha-puja) is based upon Srila Bhaktivinoda's arcana-paddati that he gives in his Bhajana-rahasya. His paddati pertains to Guru, Gouranga and Radha-Krsna worship. In addition to the mantras he gives, I have added extra mantras specifically to Lord Jagannatha. 1) While chanting Sri Guruvastakam, Prabhupada pranams, Pancha-tattva Mahamantra and Hare Krsna Mahamantra, I set up the paraphernalia. 2) Then I purify myself and the paraphernalia with some Nrsimha mantras while I sprinkle water about from a prokshana pot. 3) Then I do a short Nrsimha puja and arati, chanting the standard Nrsimha prayers, with the aim of removing obstacles in my devotional service. 4) Then comes worship of the picture of Srila Prabhupada followed by worship of Lord Gauranga with His Panca-tattva associates. The Guru Gouranga worship I do by offering 16 upacharas with achaman water and mantra. 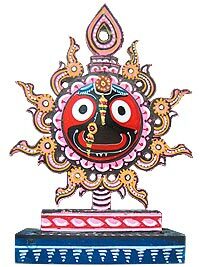 5) Then I worship the Jagannatha and Sudharshan Shilas with 16 upacharas. I physically bathe the Shilas in water and oil, and decorate Them with eyes, silver facial fixtures (smile, tilaka, eyebrows) and crowns. And then I offer flowers to the lotus feet of Srimati Radharani. mahavibhuti pataye sa maha vibhutibhir balim upaharam"
which Srila Prabhupada in his purport says is very important and "must" be chanted during Deity worship. 7) I chant Gayatri, then I recite Srila Bhaktivinoda Thakura's forgiveness prayers for my offenses. 8) Then I offer the prasada of the Shilas to Srila Prabhupada. 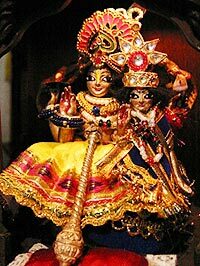 9) I worship Tulasi Maharani and decorate the Shilas with her leaves. Then I decorate Them with flowers. 10) Then I distribute caranamrta from the bathing of the Shilas, and Shila prasada to the devotees. 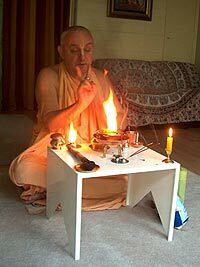 11) After offering obeisances to the Shilas, I perform a small yajna of grains and ghee (according to directions supplied by Sri Bhakti Vidya Purna Maharaja) offered on a special miniturized fire altar (which I always have with me) for Their satisfaction. The idea of the homa is that this is my way of feeding the Lord nicely each day, since for a traveling sannaysi, making nice cooking arrangements is not possible on a daily basis. But offering ghee and rice into the fire I can do. If I would only offer fruit I would feel guilty whenever I ate something more opulent than fruit. 12) At the end, after purnahuti, with the fire blazing merrily away, I chant Purushasukta and Brahmasamhita. These hymns address the Lord as the enjoyer (purusha) of sacrifice. The second is the purport to the first (i.e. that the purusha praised in the Rg Veda is none other than Sri Govinda, Lord Krsna). Also, during the set-up of the yajna I have just enough time to chant Kalisantarana Upanishad and Sri Siksastakam, again the second being the purport to the first (the Upanishad being the Vedic source of the Hare Krsna Mahamantra, and the 8 prayers of Mahaprabhu revealing the purest mood prema bhakti of chanting that mahamantra, since the upanishad only goes up to moksha in its presentation). It all takes about two and a half hours. It is indeed time-consuming. But very rewarding. It helps me focus on my chanting and hearing. Whimsical as I may be, I've become attached to this sadhana of Deity worship. When I am traveling en route from one place to another, I do cut the worship down, but with reluctance. What I often do in that case is just the yajna. It takes only 20 minutes. Actually, a yajna done for Deities is symbolic, you might say, of the whole puja. By remembering the significance of each step of the yajna, you actually do manasa-puja. Oh, by the way: some readers may be wondering, "What about the Deities you had with you?" Yes, I was keeping a small set of beautiful Lakshmi Sheshasayi Deities. But I've entrusted Them to the care of Rupa Vilasa Prabhu and his family in Kolhapur, the place of Mahalakshmi. So the beautiful little brass forms of Kshirodakashayi Vishnu seated next to Lakshmiji upon Anantashesha will remain there. Deities are really better taken care of when They remain in one place. Shilas are ideal for traveling. 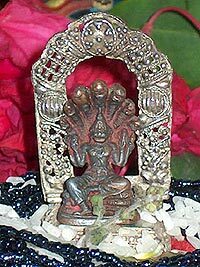 I continue to worship Lakshmi-Sheshasayi in Their form as Shaligram Shila.